This is a fun math center where kids get practice with place value. They match up cards for numbers 10-20. The cards work on Number and Operations in Base Ten. This math center is perfectly aligned for Kindergarten and First Grade, but it will make an excellent review for Second Grade as well. K.NBT.A.1 Compose and decompose numbers from 11 to 19 into ten ones and some further ones. 1.NBT.B.2 Understand that the two digits of a two-digit number represent amounts of tens and ones. 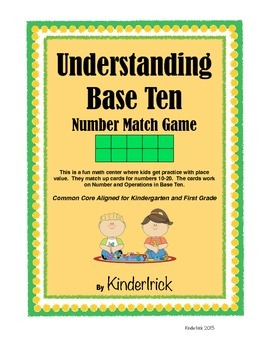 Through the use of these cards students will gain a thorough understanding of base ten. There are 6 different answer sheets to choose from. The cards can be used as flash cards as well. Please download the preview for a closer look at all that this unit comes with. There are so many different combinations of cards and answer sheets you can use this math center all year long!